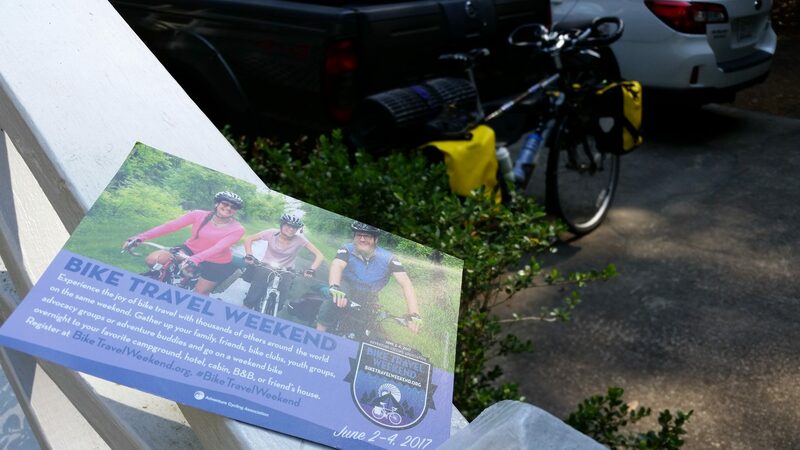 In 2016, Adventure Cycling Association promoted the first weekend in June as Bike Travel Weekend. They encouraged cyclists to get out for an overnight ride to somewhere, anywhere. The goal was to motivate more people to choose cycling as a mode for travel. 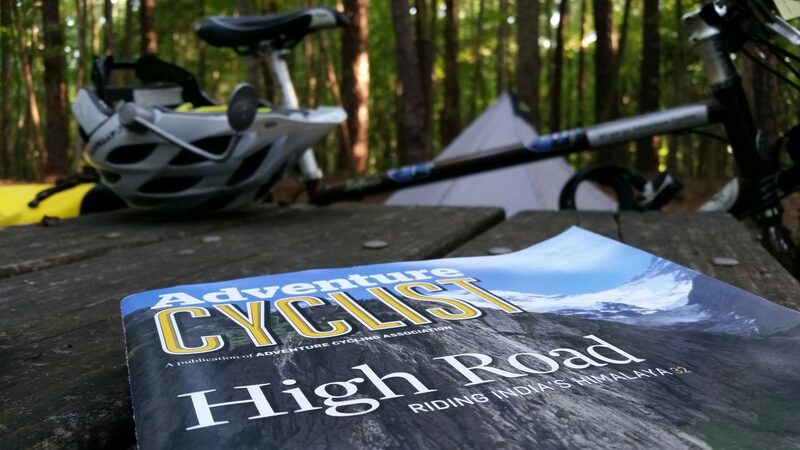 You could ride to a friend’s house and spend the night or ride to a campground or hotel, just as long as it was an overnight trip. I definitely wanted to participate again this year, but my lack of saddle time this spring could pose a problem. The group I rode with last year was riding the same 3-day, 2-state, 190-mile route again. That was a fun trip. But I knew if I joined them again I would definitely suffer. I’m not afraid to hurt a little, but a shorter trip would let me enjoy the experience a lot more. What options did I have? 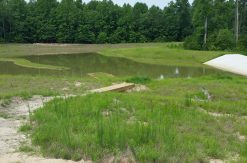 The Triangle area of North Carolina is home to several State Parks and State Recreation Areas with campgrounds. Umstead State Park is practically in town, located next to the RDU airport between Raleigh and Durham. 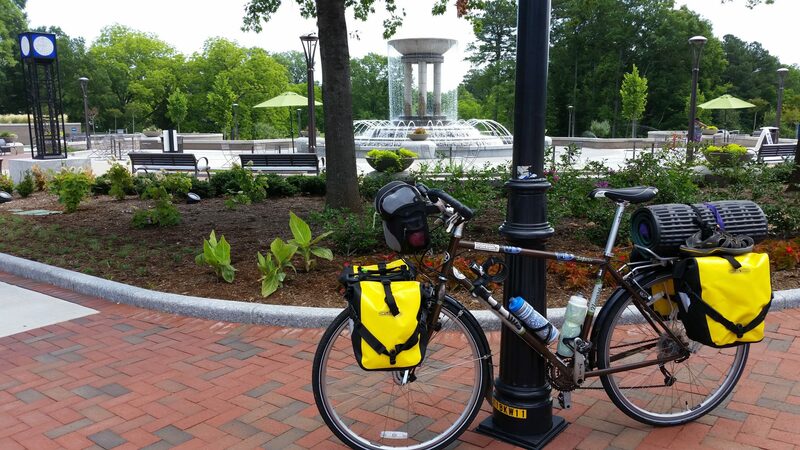 Cyclists can easily ride to Umstead via greenways from Cary or Raleigh. 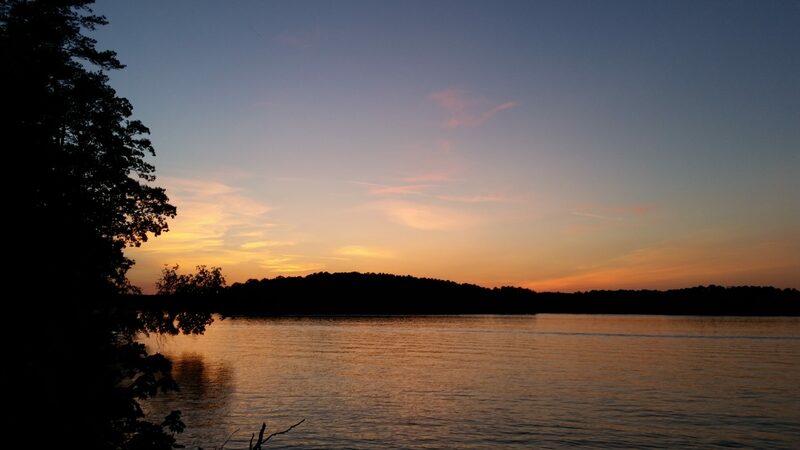 Several campgrounds can be found in the Falls Lake State Recreation Area, north of Raleigh. 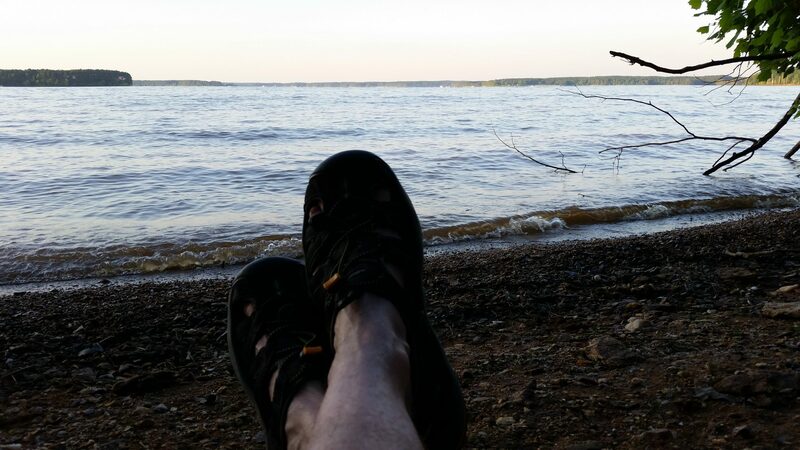 Jordan Lake State Recreation Area is west of Raleigh. It totals more than 1,000 sites in all of its campgrounds. These lake areas are a little farther out of town and require a few miles of road riding to reach, but they are still pretty convenient for cyclists. The New Hope Overlook Campground has long been on my to-do list. 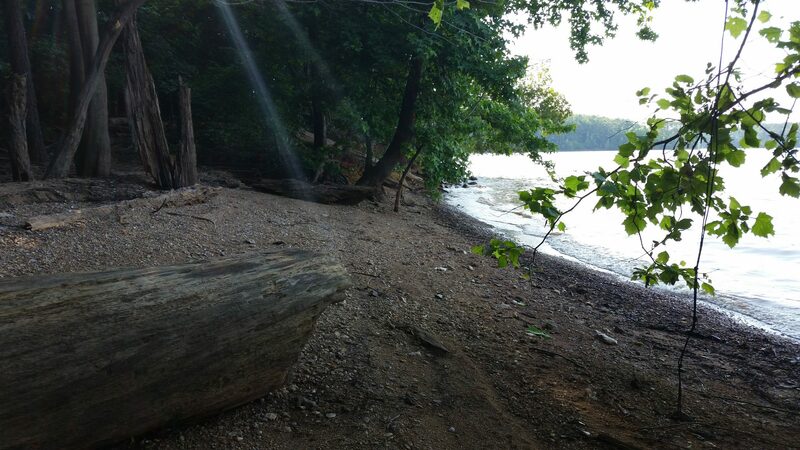 It is a simple, hike-in campground located near the southern end of Jordan Lake. Other campgrounds along the lake see heavier use because they have full hookups, shower houses, etc. And they take reservations. New Hope does not. 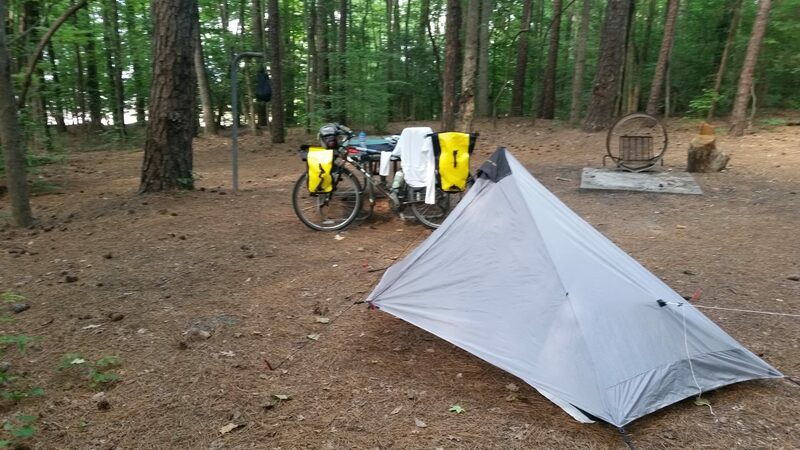 For a traveling cyclist, being turned away from a full campground can be a major issue. It usually means more miles to ride that you weren’t planning on and may not have much energy left for. But I felt hopeful I would find a spot at New Hope, even on a busy summer weekend. After all, there is ‘hope’ in the campground’s name. They have always had several sites available when I’ve stopped by before. In the worst case scenario, I could simply ride the 25 miles or so back home. Riding out from my house to start a trip has always appealed to me. I’m not really sure why. Maybe I feel a greater sense of accomplishment when I’ve pedaled every foot of the way myself. Maybe it makes me feel more like a true adventure is starting. I headed out around mid-morning on Saturday, avoiding traffic by using marked bike lanes, greenways, and residential streets, including the Hinshaw Greenway. These cyclist-friendly features led me safely to downtown Cary. I stopped to check out the new Cary Downtown Park at the corner of Dry Avenue and South Academy Street. There’s a huge fountain here, with benches and bistro tables scattered around, as well as an outdoor ping pong table and checkers/chess tables. I didn’t linger too long this time, but would definitely like to come back and spend a little time here. Academy Street runs through the heart of this small downtown area and features many of the options you would expect for a revitalization project. There are several small places to grab a bite to eat or drink, like the Academy Street Bistro, Serendipity Gourmet Deli, or Ashworth Drugs with its old-time soda fountain. A block or two away you can find The Cary, a restored movie theater, and Pharmacy Bottle and Beverage. Bond Brothers Beer Company and Jordan Lake Brewing are local breweries just a few block away. I could go on naming places a cyclist might like to visit, but I had somewhere to go. Just as I started to get going again, I had to stop for the train that runs through downtown. It’s worth noting the Cary train station can be a convenient point to make a bike trip multi-modal. Taking the train to Durham, Burlington, or Greensboro and then cycling back could be a nice adventure. Yes, it’s on my list! 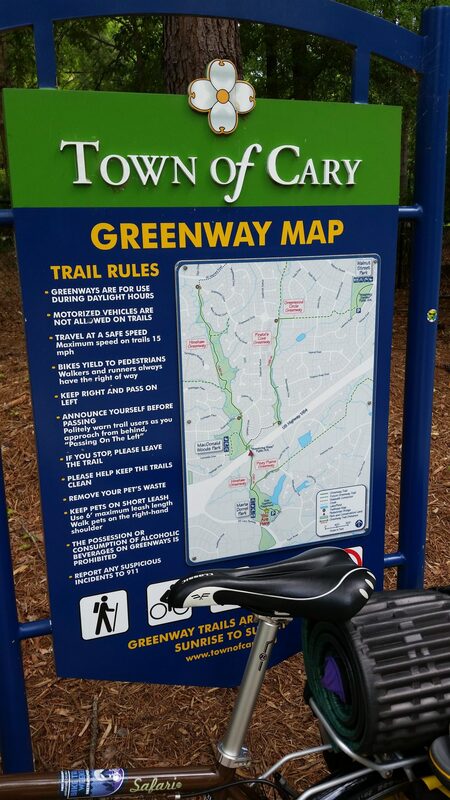 A few blocks west of Academy Street is where I jumped on the Northwoods Greenway which led me to the longest greenway in Cary. 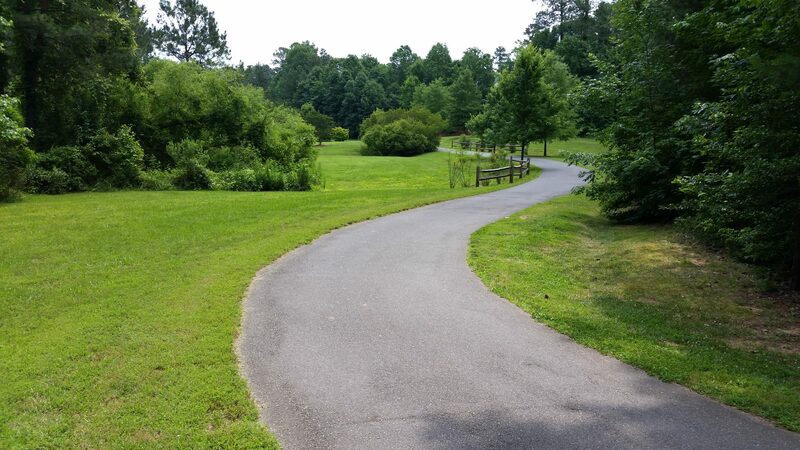 Black Creek Greenway starts at Umstead State Park on the north side of Cary and runs southwest across town to Bond Park. I joined this greenway right in the middle. Where the greenway isn’t completely separated from traffic, a wider than normal sidewalk is usually provided. One stretch like this runs along Maynard Road. This is where I found the Cycling Spoken Here bike shop. I stopped in to pick up a spare tube. Just in case. Another block down the street is where Great Harvest Bread Company is located. I stopped in there too, to pick up some spare sweet treats. Just in case. 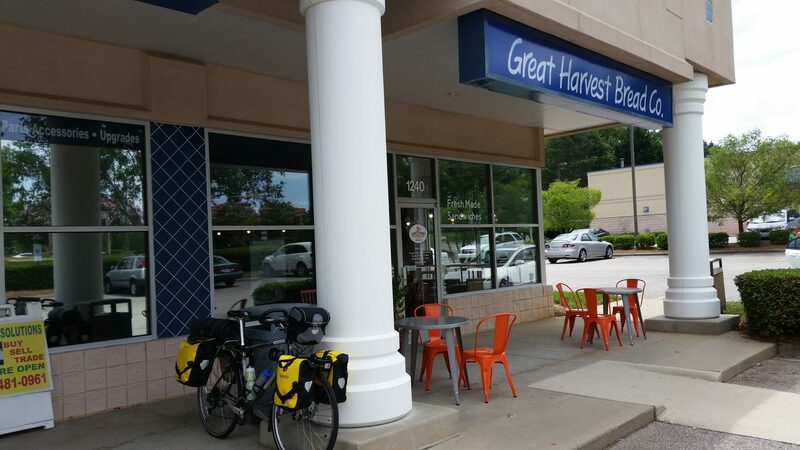 Tom and Paige Williams are the owners and operators of Great Harvest and are cyclists themselves. Tom often bikes to work. He doesn’t have to worry much about traffic, not at 4 am. Their staff is always friendly, plus they give out free samples! After I ate one pastry and figured out how to carefully pack the others into my panniers, I continued down the greenway and through Bond Park. 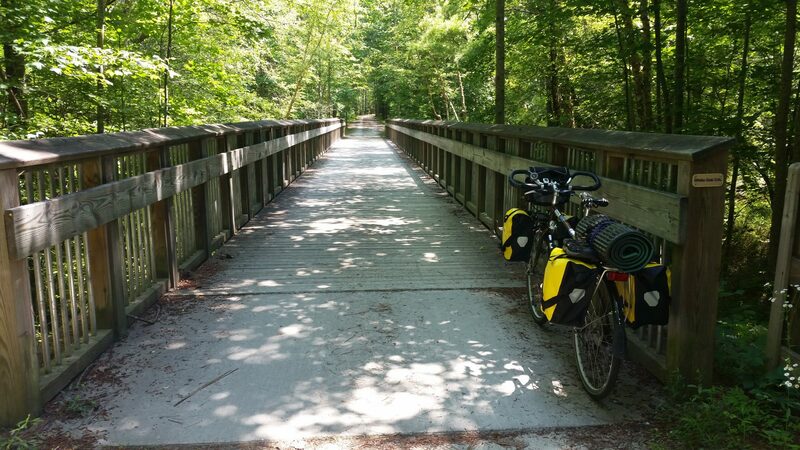 The White Oak Creek Greenway starts at the end of the Black Creek Greenway and led me almost all the way to the American Tobacco Trail, a rail trail that runs from Durham to Apex. 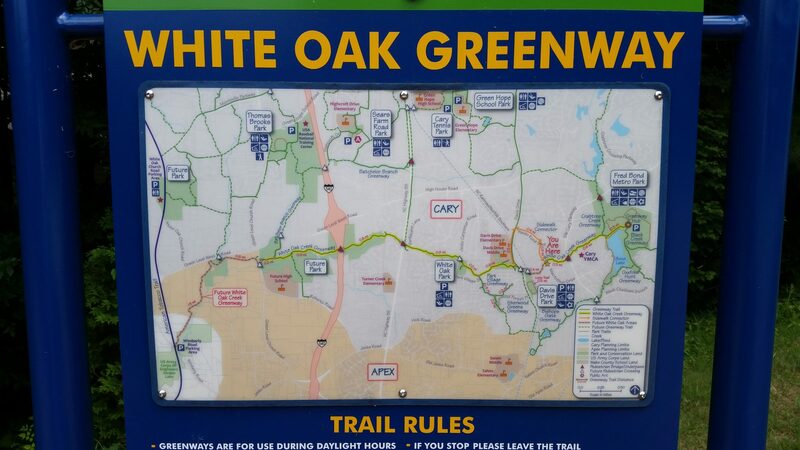 The end of the White Oak Creek Greenway left me about a mile short of the ATT. Luckily it’s a pretty straight shot along Green Level West Road to the ATT, and a greenway extension project is already in the design contract phase. But I didn’t turn onto the ATT when I reached it. I had another stop in mind. I kept going and made the next left turn onto Wimberly Road, and then a right turn onto Castleberry Road. That brought me to the gates of the Cloer Family Vineyards, less than half a mile from the ATT. 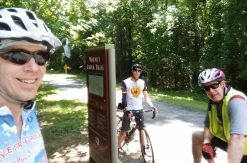 The Cloer’s have hosted an annual ride for the East Coast Greenway Alliance the last two years, where participants ride down the ATT from Durham, have a little celebration here and then ride back. 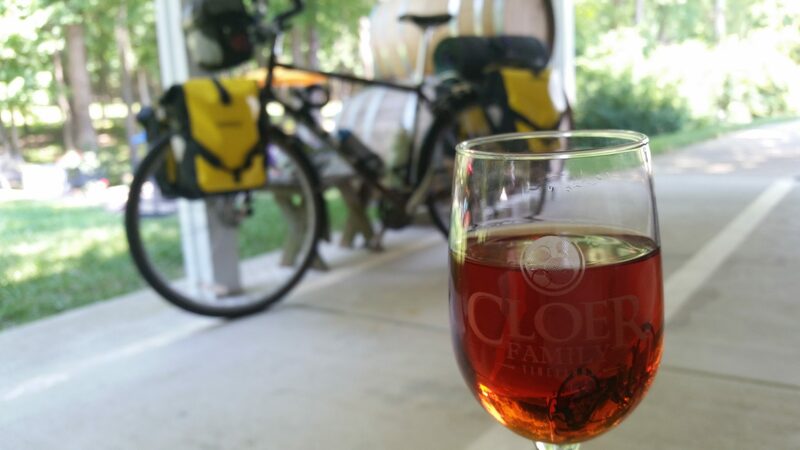 I propped my bike in the shade and found Pam Cloer in the air-conditioned tasting room. Two ladies, childhood friends from western New York, were just starting a tasting. They invited me to join them despite my cyclist attire, helmet-hair, and trail dust. We enjoyed sampling the Cloer wines, some of which are made from grapes grown elsewhere. I especially liked the wines made from the Muscadine grapes they grow on site. Those wines had the distinct muscadine flavor, but without being overly sweet. We traded stories back and forth and laughed until the ladies decided it was time to move on to their next tasting stop in Pittsboro. The ladies tolerated my sense of humor and were kind enough to pay for my tasting, so I paid that forward by buying a glass of Isobella’s Blush from Pam and sitting on the covered porch to sip and enjoy it. Two other cyclists rode up and chatted for a few minutes. One guy was quite interested in my touring bike and pannier setup. He had ridden part of the Great Divide Mountain Bike Route a few years before with a rack and rear panniers on a hard-tail mountain bike, appropriate for those gravel roads and trails in the Rockies. 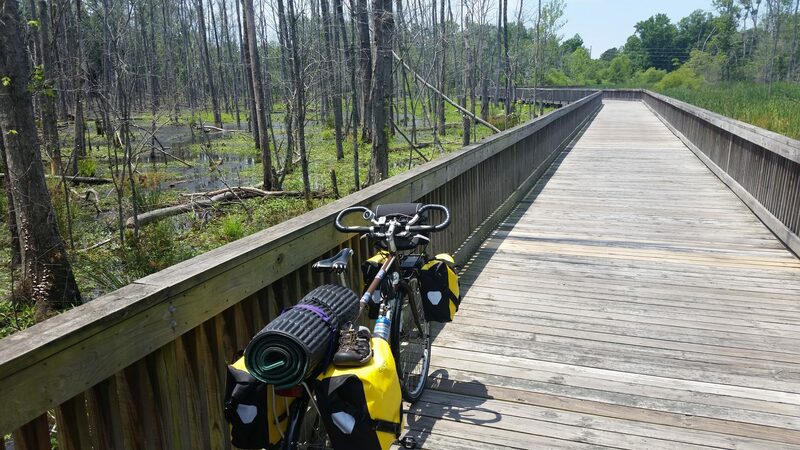 He liked the idea of a touring bike that would do well on the easier terrain and paved trails in this area. 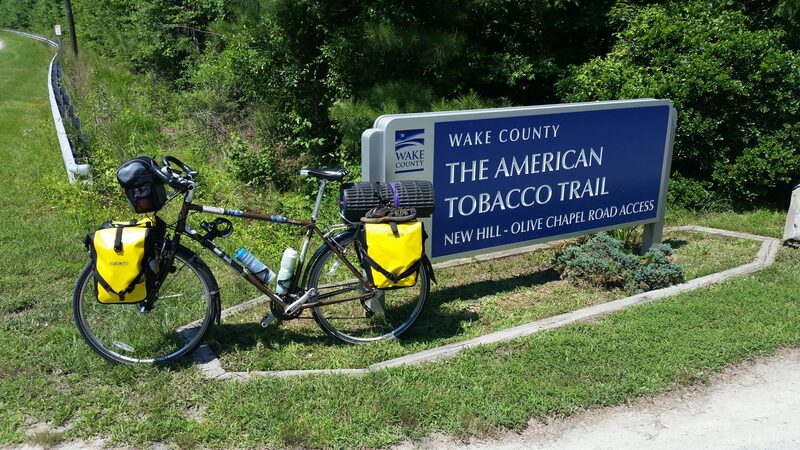 I eventually got back on the bike and rode to the south end of the American Tobacco Trail. From there, I still had about ten miles of lightly traveled rural roads to get to the campground. 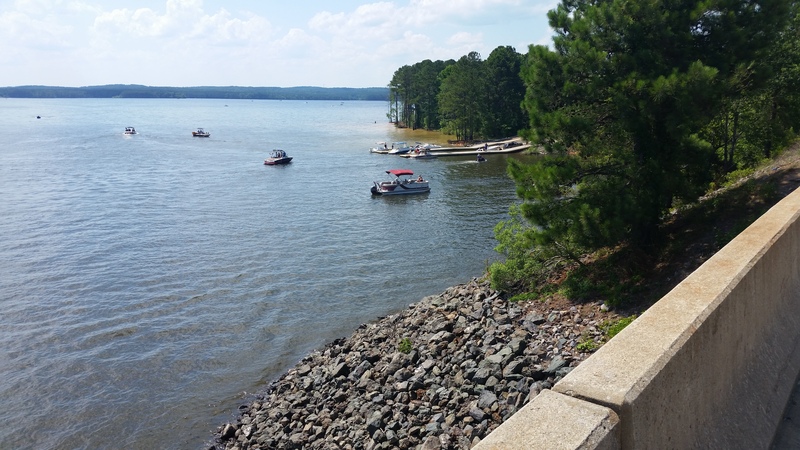 At one point, the road crossed over an arm of Jordan Lake. I stopped to watch the boats swarming around the lake enjoying some ‘lake life’. It looked a lot busier on the water than on the roads I was riding! The two guys working the entrance booth to the New Hope Overlook area didn’t think anyone was camped on Loop A. I had my choice of any site on either loop that wasn’t already occupied. 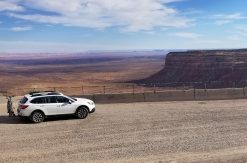 Both loops consist of hike-in sites, meaning there’s a parking lot at each loop and you have to haul your camping gear down a trail to the sites. That’s perfect for cyclists! Our stuff is already loaded onto something with wheels when we arrive. 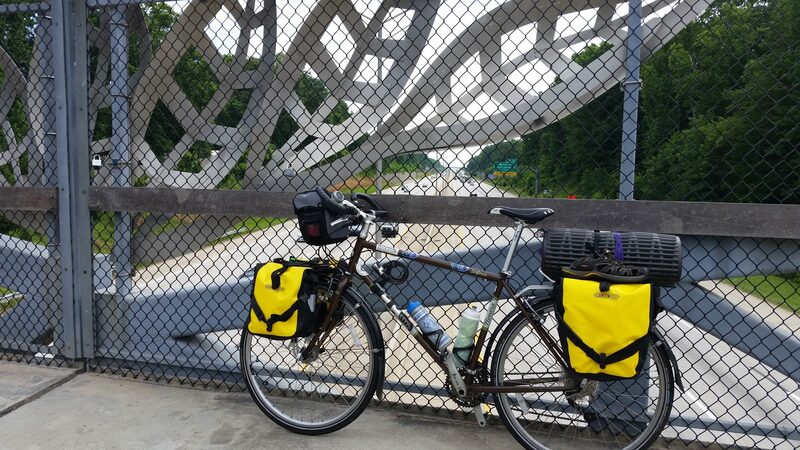 I rode to Loop A and stopped at the first site – A1, to check things out. My mileage so far for the day was just over 32 miles. I found a well-used footpath from site A1 through the woods down to the water’s edge. I also walked around to check out the other sites. Site A2 was a little more level for tents, but didn’t have a path to the water. The remaining sites didn’t look much better, except for maybe a few at the end. They were occupied and had friends with boats visiting, or they had their own boats in the water, so I didn’t get to look too close. I also found the centrally located pit toilets and a water spigot. All sites have a picnic table, fire ring, and lantern/trash bag post. I chose to stick with site A1. It was the farthest from the other campers and it had that path to the lake. Exploring the water’s edge a little more, I found a small 20′-wide private gravel beach. After setting up my tent, I chilled out on the beach in the shade for a few hours watching the boats churn up the lake. It is good to get away and just decompress sometimes! Contrary to my concerns about the campground being fully booked, I only saw a few people from other sites all evening. One group was a father and young son who walked in and camped a few sites down. The other was a couple and child who walked out to their vehicle and apparently went to get more groceries. I ate dinner (did I mention some pastries earlier? ), read a little, and went to bed. I never heard the other campers during the night, but I did hear raccoons get into one of the metal trash cans by the parking area. The birds woke me as the sky started to lighten, followed shortly by the sound of a loudspeaker booming across the lake. 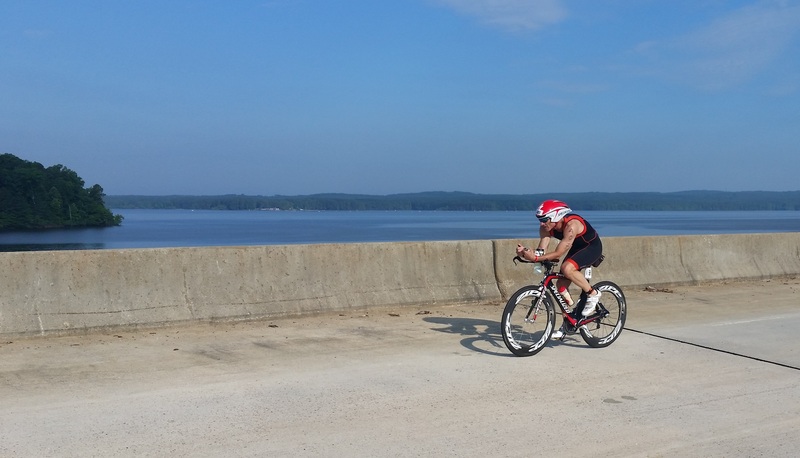 Apparently, the start and swim area for the Raleigh Half-Ironman Triathlon was across the lake, about two and a half miles away. From my little beach, I could see the buoys marking off the swim section. Every ten minutes, another set of triathletes got to dash into the water and drown their pre-race butterflies. I ate breakfast (did I mention pastries earlier?) and broke camp without seeing any of the other people in the campground. I worried that road closures due to the race might cause me problems. The bike route came by the campground entrance and there was no other way out. When I arrived at the road, the only sign of the race was a lone cyclist. I chose to backtrack along yesterday’s route, which put me riding against race traffic. They were mostly heads down, trying to find their groove. They still had a long way to go, and the day was heating up quickly. A few of them looked up and waved. Hundreds did not, which is ok since waving back at each and every one of them would have worn be out! 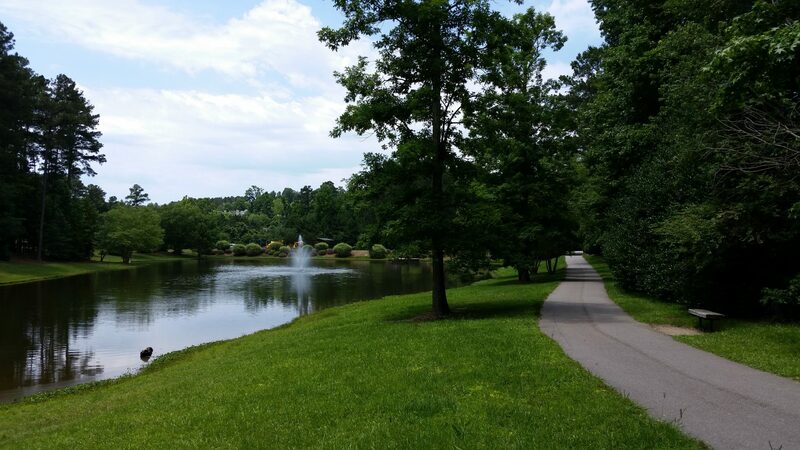 When I reached Bond Park, I decided to turn onto Cary Parkway and follow it back to my side of town. This four-lane road has a planted median separating the two sides. It is far from a perfect road for cycling, but Sunday morning traffic is fairly light. I decided to give it a shot. The Town of Cary has signed this part of Cary Parkway as Bike Route #3. The outside lane is wider, so I wasn’t completely crazy. This route change would shave about six miles off my total for today. Since this was day two of my get-in-shape-as-you-go training program (you know, the day with all the soreness from day one), I was happy to cut off a few miles. I successfully finished up my 2017 Bike Travel Weekend ride on the familiar residential streets and bike lanes of my local workout routes. That’s another benefit of riding out from home in the beginning! Trip totals: 58 miles, 4 pastries, 1 noisy raccoon, and 0 flats.